A Ranger in its original appearance in GTA London 1969 and GTA London 1961. The Ranger may refer to any one of two distinct off-road vehicles in the GTA series. The Ranger name was first used in Grand Theft Auto: London, 1969 and Grand Theft Auto: London, 1961 for a civilian 4x4, while Grand Theft Auto: San Andreas reintroduces the Ranger name for a rural police vehicle. The London renditions of the Ranger, with a top-down profile similar to a Land Rover 109" Series II, are essentially 4x4s comparable to Grand Theft Auto 1's 4x4 and Repair Van, reflecting off-road vehicles of the games' era and setting. Despite its use by civilians, the Ranger only appears with a green body and a white roof. Like the Repair Van, it also features a front-lid mounted spare tire, similar to a Land Rover. In GTA San Andreas, the Ranger is depicted as police-issued Ranchers that are outfitted with sirens, light bars, radio antennas, and a camper shell/criminal-hold in the back. Its color scheme is also distinctive from "panda" paintwork seen on standard police cars in the game, featuring a white hood, a black roof and a white camper shell. A Ranger in GTA London 1969 and GTA London 1961. A police Ranger in GTA San Andreas (presumed to belong to Barbara Schternvart as it bears a customized license plate) (Rear quarter view). GTA London's Ranger is a somewhat lumbering vehicle, with average top speed but below-average acceleration, bulky weight, poor brakes and poor handling. However, the Ranger does have one of the fastest maximum reversing speed, on par with the Beagle 3. The Ranger's base export value is £500 if delivered in perfect condition. GTA San Andreas's Ranger handles almost the same as the original Rancher. It is slightly faster, and has slightly larger ground clearance, It also has a slightly more durable body and can sustain more damage than the Rancher. It is a great off-road vehicle and can drive on rocks. Despite this, because of weight and little traction, it isn't the best vehicle for hill climbing. Doing so will often cause it to tip over, falling down the mountain. Immediate, simultaneous sharp turns made at high speeds can also often cause it to tip over. 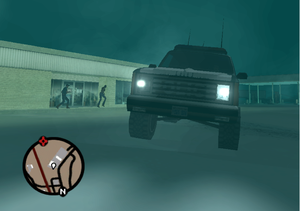 The irregular headlights of the Ranger in Grand Theft Auto: San Andreas. Due to modeling errors, the Ranger in GTA San Andreas features two peculiarities. When damaged significantly, smoke or fire will emerge from the center of the vehicle instead of its engine in the front. In addition, its right headlight does not illuminate completely, as it only glows. The GTA San Andreas rendition of the police Rancher appears in Bully, a Rockstar Vancouver game, as a traffic vehicle in the town area. The Ranger in GTA San Andreas is primarily native to rural San Andreas, where rough terrain merits its presence. In a garage next to the Police Department in Dillimore. In front of the El Quebrados sheriff's office when dating Barbara Schternvart. It will be unlocked once you have reached 50% relationship status with her. This page was last modified on 14 October 2012, at 18:41.